I have been using Samsung for a number of years in the same house, without call issues. I got the dual sim model a week ago and only just received a call (since I dont use call feature much) and my friend told me the reception is bad. Got annoyed and said would call me tomorrow. I noticed that my phone sits on 4G+ when it is not in call but when I call it switches to H or 3G. Is this normal? Is this might be what might be causing the issue? Sadly reception is an issue with the KEYone that some have struggled with. I'm not sure if anyone has figured on if it's a particular band that is an issue. 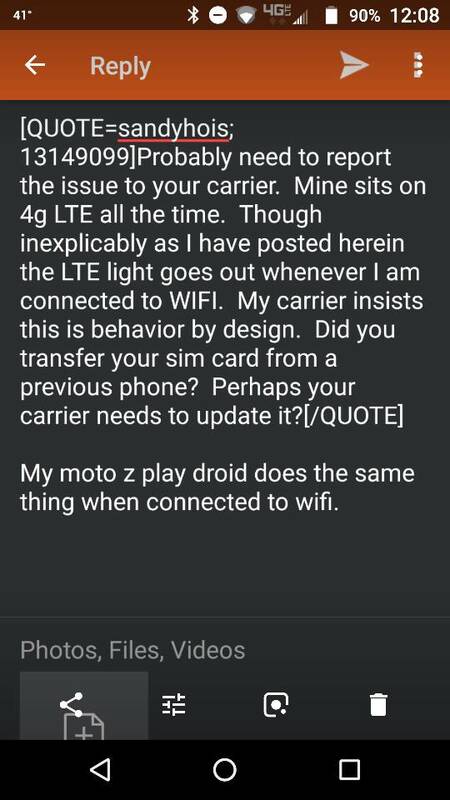 Probably need to report the issue to your carrier. Mine sits on 4g LTE all the time. Though inexplicably as I have posted herein the LTE light goes out whenever I am connected to WIFI. My carrier insists this is behavior by design. Did you transfer your sim card from a previous phone? Perhaps your carrier needs to update it? Contact your carrier and have them check, maybe get a new SIM. Next contact BBMo and report the issue... try to gather details before hand. Maybe they'll have a suggestion, or at least send you a replacement that might fix your issue (for others it didn't - but not all cases are the same). Hi guys, sorry the site didnt send me a email notification of all the replies for some reason. I use Boost in Australia which uses the Telstra network. So seems like I may need to send them a message to ask? Before I had a micro SIM card in my Samsung before moving. So they needed to send me a nano SIM card (blank). And then they set it up. I will go back to them and see how I go. Sounds like what was happening with my unlocked KeyOne on AT&T. It would drop down to 3G for calls, which is an older network. I would often get dropped calls in the same areas I did before LTE came out. I learned that AT&T will not provision non branded AT&T phones for VoLTE (other than Apple). So, I returned the unlocked version and purchased an AT&T branded KeyOne. Problem solved. Phone uses VoLTE and problems went away. Yep this is the issue. I forced my carriers hand in Canada (Rogers) to provision my black Keyone, but it was complicated and invovled way too much time and too many government complaints. 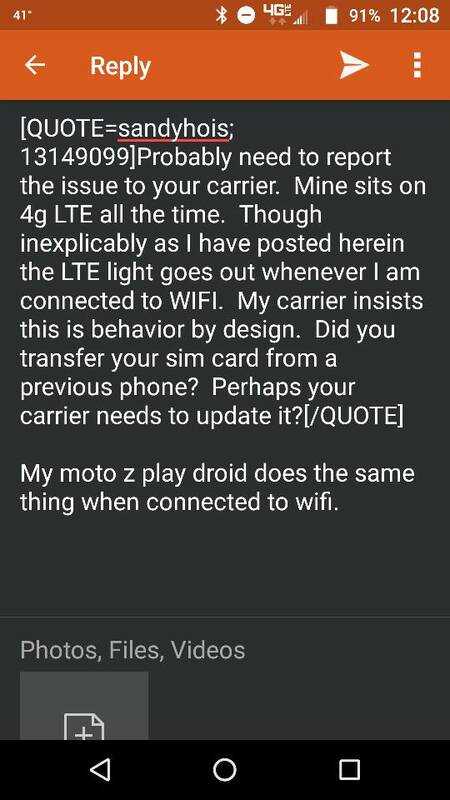 My moto z play droid does the same thing when connected to wifi. I believe ATT is a big part of the problem. Their Tech says cannot make an unlocked phone do wifi calling, VOLTE, LTE at all, etc. I know one can get a TMobile SIM and do ALL that. I pointed it out and he had no response. I told him ATT was "punishing" customers for NOT purchasing from Them. ATT's supercilious attitude is not good. IF BlackBerry Mobile acquires adequate Market share, they should address this issue. Wifi calling is a different beast all together in terms of provisioning on the back end. But there is no reason other than laziness and greed that ATT doesn't provision unlocked phones for VoLTE. Correct me if I am wrong. I was led to believe that a SIM card from a previous different brand phone needed to be configured by the carrier to your new phone. is this correct? The carrier is a big part of the signal problems experienced on the KeyOne. I had a Rogers account for 6 months (located in North Vancouver Canada). Had nothing but problems - weak signal, dropped calls). Changed to Bell and haven’t had any problems. Rogers should spend more money on phone coverage and less on sports teams and arenas or else get out of the cell phone business. Last edited by rickzimmerman; 03-26-18 at 08:06 PM. Reason: To correct spelling mistake. rolfep and OriginalLucy like this. I dont exactly know what you mean? I bought it from Expansys and it had ticks with each of our 3 main networks with LTE Band 1 and Band 28 with the Telstra network which it says that model is compatible with. I have another SIM I am going to put in but it also uses the Telstra network. Optus seems to have more spectrum support, so may need to purchase a prepaid $5 card to test it if still same issue. I'm not sure what you mean on the CDMA thing however. So I put the Aldi Mobile SIM card in today in the SIM2 slot and still only get H/3G in calls as well. BTW is the 2nd sim not supposed to be in 4G mode at all as you can't select it to be any other mode than 3G/26 if SIM 1 is in 4G/3G & 2G? So maybe I should email them to ask why its not in 4G. aha, OP, you are downsouth... hopefully, you have better luck than NA chaps, see link below... (not sure about LTE coverage downsouth... it is not only the frequency, but also the coverage and capacity of your carrier - assume you don't have antenna issues for your neck of the woods). Not all phones are supported for Voice over LTE (VoLTE) (aka 4G Calling or HD Voice), if the phone isn't supported for VoLTE, the phone doesn't support VoLTE or VoLTE is turned off in the phone settings then it will revert back to 3G for calling to allow calling to still work. You can check your phone settings, it should have under mobile data an option for 4G/LTE which if it can support VoLTE will let you select 4G/LTE for Data Only or Voice and Data, if data only is selected it will only work for data, if voice and data is selected where possible it will use 4G/LTE for voice services as well. I replied Keyone has LTE support just today. In the SIM manager in Keyone I have 4g/3g/2g for this carrier. On top of that I also tried Optus from buying a prepaid and same issue. How to install Whatsapp and Spotify? By Tokocaci in forum New to the Forums? Introduce Yourself Here!